Irma, which made landfall in the Florida Keys yesterday afternoon as a Category 4 hurricane, has now been downgraded to a tropical storm. The system, which is now 400 miles wide, may have lost some strength, but it’s continuing to produce heavy winds and rain as it marches northwards towards Georgia. As of 8:00 am local time, Irma’s center was about 105 miles (169 km) north-northwest of Tampa and about 30 miles (48 km) north-northeast of Cedar Key. 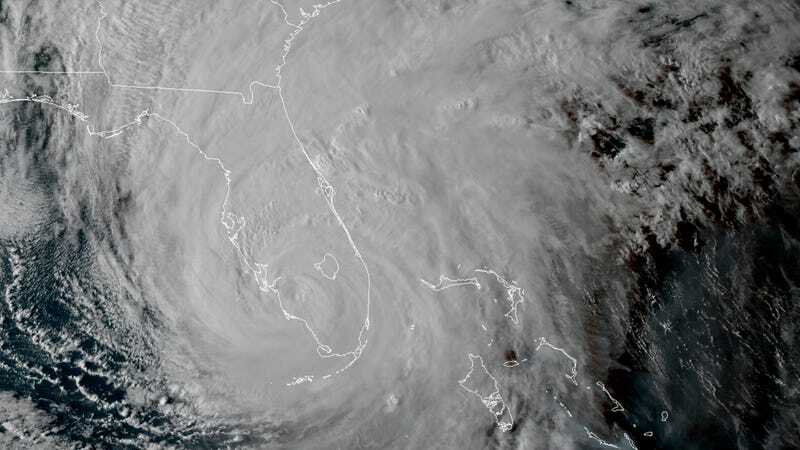 The storm came ashore on Sunday afternoon in southwest Florida as a Category 4 hurricane, causing extensive damage to the Florida Keys, Miami, Naples, and several other areas. Incredibly, Irma was a hurricane for 11.25 days, which is the most since Ivan in 2004. But Irma isn’t done yet. Now a tropical storm, the system is still capable of producing hurricane-strength gusts, and maximum sustained winds of about 70 mph. The storm has a particularly large wind field, extending across the entire Florida peninsula. From here, the storm will likely weaken further still, and it’ll probably be downgraded to tropical depression by Tuesday afternoon, according to NOAA. Several storm surge warnings are still in effect, the most urgent extending from South Santee River to Fernandina Beach (4 to 6 feet) and Clearwater Beach to Ochlockonee River (4 to 6 feet). 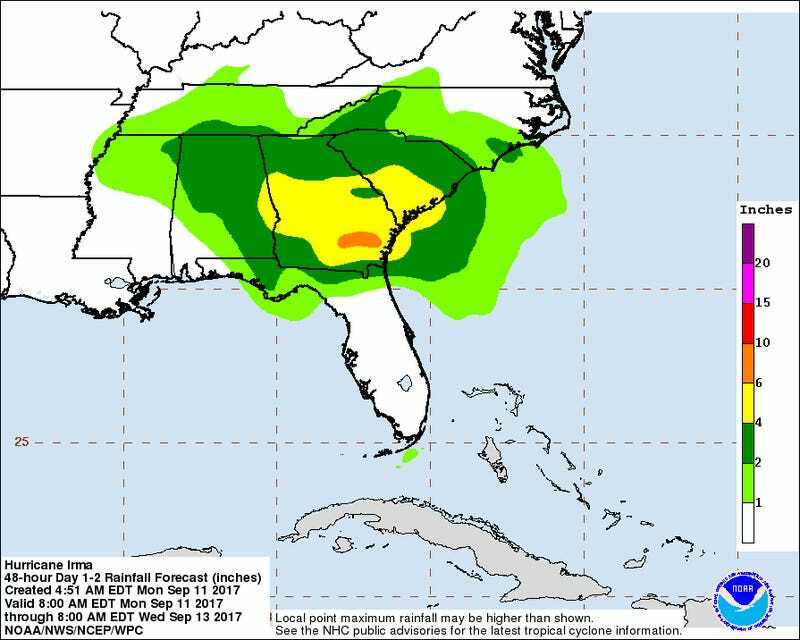 Heavy rains are predicted for northern Florida and southern Georgia, which could see an additional three to six inches with total amounts reaching between eight to 15 inches. Tornadoes are possible in northeast Florida, and southeastern portions of Georgia and South Carolina through tonight. Officials in Jacksonville issued a flash flood emergency this morning. Heavy rains are causing rivers to swell, and significant flooding is possible over the next five days, both along the Florida peninsula and in southern Georgia. As daylight returns to Florida, the damage inflicted by Irma is becoming clear. At least four people were killed by the storm in Florida, and 3.3 million people are currently without power. In Miami, streets were turned into rivers as water poured in from the storm surge, and construction cranes collapsed under the force of 100 mph (180 km/h) winds. The Florida Keys were hit particularly hard by Irma, with reports of massive damage caused from a combination of wind, rain, and surge. A huge airborne relief mission was dispatched yesterday to assist with recovery efforts. As all this is happening, meteorologists are nervously watching a newly formed disturbance in the east Atlantic that has a 30 percent chance of developing into a cyclonic storm in the next 48 hours. Sigh.